Thread: Are These Sql Injection proof ? Is this code sql injection proof ? I did not write it. I just added the sessions and changed the column names. Copy & paste you might claim. If it does not need PREP STMT then I will leave it as is. It does not need PREP STMT now does it ? It displays all rows from all columns from a table. //Grab User details from Session Variables and echo them. //Get Data from Table "browsing_histories". //Total Number of Pages Records to spread-over. Q1. What do you think ? After replying, kindly reply to my next questions in my upcoming posts. Last edited by UniqueIdeaMan; March 28th, 2018 at 06:38 AM. The following code is my own code. I built it on the skeleton of the above code I grabbed from somewhere about 2yrs back. I added PREP STMT and I got the final page to show the pagination numbers in reverse order such as: 10,9,8,7,6,5,4,3,2,1. It is supposed to show all rows from the tbl. Q2. What do you think ? Is it sql injection proof now ? Compare the 2 codes and give me rating from 1-10 where 1 is RUBBISH and 10 is GREAT to show me how well I did. More code on my beginner level code I agree but it's well worth it for me since I understand my code and learnt a few things on the way from you guys and the php manual. Last edited by UniqueIdeaMan; March 29th, 2018 at 04:56 AM. The following code is my own code. I built it on the skeleton of the above 2 codes where the 1st one I grabbed from somewhere about 2yrs back and the 2nd one was my work on the 1st one's skeleton. And, it is only supposed to show the final row of the tbl. That is all. Q3. What do you think ? Is it sql injection proof now ? Compare this code with the above post's code and give me rating from 1-10 where 1 is RUBBISH and 10 is GREAT to show me how well I did. More code on my beginner level code I agree compared to the 1st post's original code by someone but it's well worth it for me since I understand my code and learnt a few things on the way from you guys and the php manual. UniqueIdeaMan  agrees : I couldn't have agreed better myself! You went thru all that length to build this diagram which would be handy for all newbies. I actually knew the answers to my questions but nevertheless I needed the seniors to confirm incase I overlooked anything. The following snippet is from my 2nd post. As you can see, there are 2 queries (query_1 & query_2). Now, I was so much into PREP STMTs that I overlooked something. Do you see both queries using PREP STMT ? Yes. Now, looking at the 2nd query, the final parameter is $offset which is a user inpu via the $_GET and therefore, I believe you will agree that I have used the PREP STMT here as I should. But, it has come to my attention this instant that the 1st query ($query_1) does not have it's parameters fed by the user but by the script/programmer. Therefore, I guess I should not be using PREP STMT here atall and so do you suggest I rid the PREP STMT or do you reckon I should I just leave it as it is ? Another question, if I use PREP STMT on a query that have parameters that are not user inputs but variables from $_SESSIONs or $_COOKIEs then would that harm my code or script or anything in any way if the query contained PREP STMTs ? If not, then I might aswell just leave things as it is just incase $_SESSION or $_Cookie variables can be sql injected in the future (if not now). That way, I save myself having to update the script. Can $_COOKIEs and $_SESSIONs get sql injected at present and do you reckon they will get sql injected in the future if they can't be sql injected at present ? Last edited by UniqueIdeaMan; March 31st, 2018 at 05:19 AM. There no real reason to not use parameter binding. While it's not necessary for safe non-user input, it doesn't hurt either. I generally use bound parameters for everything just to be consistent, it's not worth my time to think about whether some variable is safe or not and could be used directly vs needing to be bound, just bind everything. $_SESSION may or may not be user input, depending on the original source of the data. Thanks Kicken! I might aswell leave things as they are (keep the binding_result even if there are no binding_params). Anyway, all the questions now about whether I should use PREP STMTS on queries that are not user inputs but programmer or cookie or session inputs arose from that question of Barand. Anyway, I am glad he brought this to my attention: That PREP STMTS are not necessary on queries that have no params as I got so much stuck into PREP STMTS that I always now use PREP STMTs and with that habit I was trying to convert this following code (which I grabbed from online somewhere 2yrs back) to convert it to PREP STMT using mysqli where it is not really necessary to do the conversion and so been wasting over a month on it for nothing. Been trying for over a month and coming across lots of obstacles and learning a lot of things from you guys on the way such as to use Count(*) over mysqli_num_rows or mysqli_stmt_num_rows if I just want the row count without the row data and learnt a few more things on the bumpy way and so been a little worth it all that time wasting. I can now call it "time spent a little too much" over "time wasted all for nothing". I'm not bothered converting this to PREP STMT unless you say ofcourse that I should because there is a risk of sql injection. 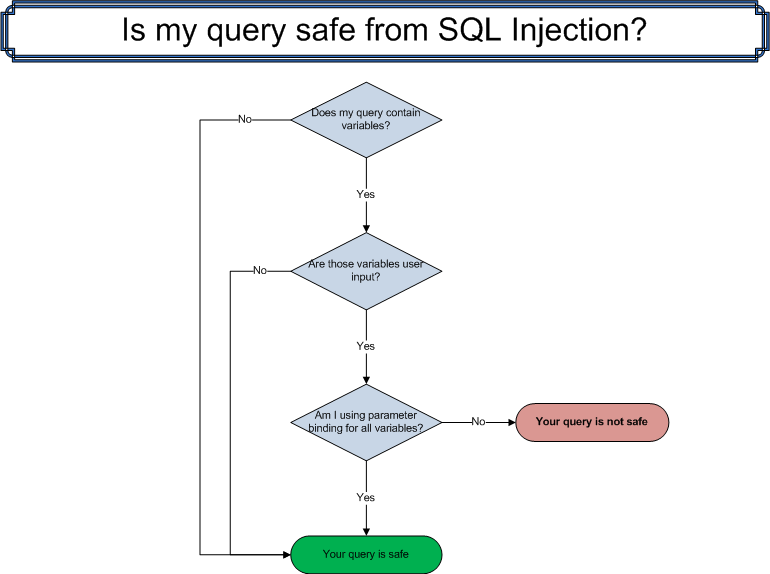 From my experience and from the look of your diagram, there is no sql injection risk but you are welcome to correct me if I am wrong. What do you think ? I did well on the conversion, right ? Even though a bit too slow. Took me over 4wks to come to this point coming across lot of obstacles. Last edited by UniqueIdeaMan; March 31st, 2018 at 06:02 AM. Check the post just above it! Last edited by UniqueIdeaMan; April 2nd, 2018 at 04:12 AM. Anyone else can answer what I asked Kicken above.